In 2011, CCB successfully bid for funding from the Big Lottery Fund’s Local Food Programme, to establish community orchards in four areas of Wokingham Borough. 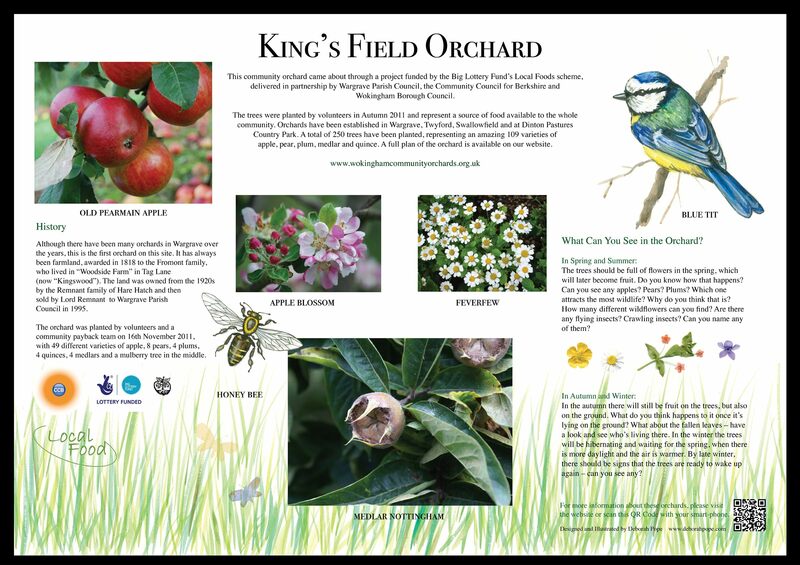 The grant of £26,889, along with financial and ‘in-kind’ support from Wokingham Borough Council, enabled the creation of orchards in the parishes of Twyford, Wargrave, Swallowfield and Shinfield, and at Dinton Pastures Country Park. The project’s a im was to help develop an understanding of the links between growing food and healthy eating. There is a rich history of orchards in the area, and their re-introduction is of great strategic benefit to the locality, particularly in reviving old apple varieties with local significance. In addition, the project addresses other needs identified through consultation with these rural communities, including the enhancement of public spaces and an increase in wildlife diversity. In total, 345 fruit trees have been planted. 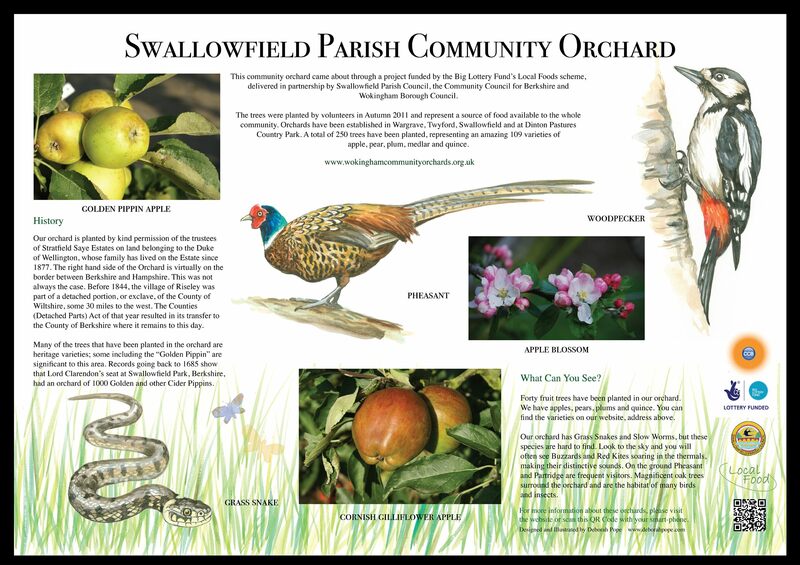 The Swallowfield orchard is located next to the Riseley Village Tea Room and Memorial Hall on Odiham Road in Riseley. Click here to see an image of the information sign at the orchard. 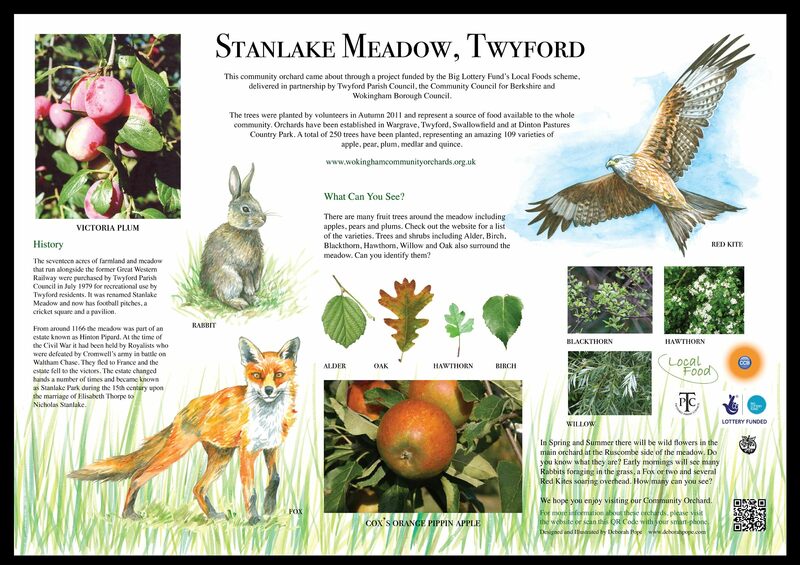 The Twyford community orchard is located at Stanlake Meadow. The Wargrave Orchard can be found at Kings Field, accessed from Blakes Road. The orchard at Dinton Pastures can be found along the first fairway of the golf course, behind the Dragonfly Cafe. Click here to see a map of the park. For more information, please contact Tim Parry on 0773 888 7611.